From its road-going configuration, the vehicle becomes a helicopter with eight sets of rotor blades for vertical take-off. Once aloft, it transforms again into a fixed-wing aircraft. The SkyCruiser was built by Krossblade Aerospace Systems, a start-up originating from the makerspace HeatSync Labs in Arizona. The group is dedicatedto developing swift and easy air transport for everyone; their ‘switchblade’ transformer mechanism could be incorporated into a range of aircraft. It looks like crowded skies for flying cars right now. With AeroMobil’s Flying Roadster 3.0 the SkyRunner dune buggy, ITEC’s new flying vehicle, and the latest Terrafugia Transition just out, any new contender needs something to stand out from the flock. Krossblade CEO Dan Lubrich argues that the SkyCruiser is not just another flying car. It’s a roadable aircraft that’s optimized for flight, rather than a hybrid vehicle that’s not really great at either. While AeroMobil Roadster cruises at 124 mph and Terrafugia’s makes 100 mph, the SkyCruiser zips along at more than 300 mph. Its range of 1,000 miles can take you from New York to Washington, San Francisco to L.A., or London to Paris with ease. The SkyCruiser’s vertical takeoff ability means you don’t need an airport or a runway—it could take off from any reasonably open space. You probably live within a mile of a suitable take-off point, Lubrich says. “I personally do not see a huge advantage to driving to an airport seventeen miles away (the average distance a US person lives form the nearest airport), then flying relatively slowly, and then driving again after landing,” Lubrich says. “One saves the time by not having to change vehicles, and the flexibility is great. But SkyCruiser on top of that cuts out two airports, which saves about an hour right there.” Krossblade’s construction secret is using new lightweight, powerful electric motors to drive both the hover rotors and the separate forward flight system. This means SkyCruiser can lift around 11 pounds per horsepower in helicopter mode, then cruise with the speed of a fixed-wing aircraft. The engine is hybrid, but it can land and take off on electric power alone, so it shouldn’t wake the neighbors up. Krossblade has built a miniature version, a drone known as SkyProwler, which can be seen in the video. In addition to demonstrating the concept, the little drone will provide some serious competition in the small delivery market. Amazon’s Prime Air and Google’s Project Wing are looking at small drones for parcel delivery, and they’re not the only ones. SkyProwler, with its combination of speed, range, payload, and vertical landing could be ideal for bringing shoppers anything from medical supplies to pizza. The full-size five-seater SkyCruiser won’t be around for a while. 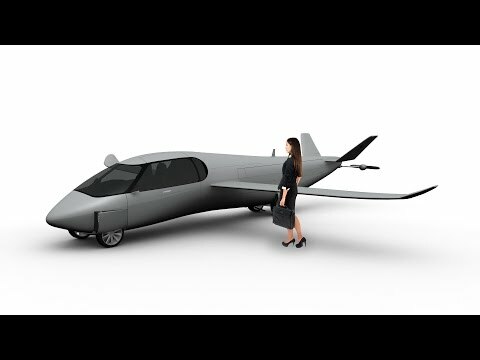 But if Krossblade can bring it to market, it could be the flying car for people who don’t have a pilot’s license. While SkyProwler may be a more immediate proposition, the five-seater SkyCruiser is rather more eye-catching. Even if you don’t have a pilot’s licence, this could be the flying car for you. “We envision SkyCruiser as fully autonomous—just tell it where to go and it will go there,” Lubrich says. The vehicle will have manual controls for those who want to fly themselves, Lubrich says. But the autonomous technology does more than open up the SkyCruiser to a much larger market—it also could help Krossblade to skirt some of the air traffic control and legal issues that have previously kept flying cars firmly on the ground. The price tag? Assuming the SkyCruiser goes into mass production, expect to pick one up in 2018 for around $350,000.